Financial risk management is a practice of evaluating and managing various financial risk associated with financial products. For example: risk towards foreign exchange, credit risk, market risk, inflation risk, liquidity risk, business risk, volatility risk, etc. Today, every investment is exposed some sort of financial risk. These risks further create possibility of failure in accomplishing the desired financial objectives. Different types of financial risks that have the potential of affecting an economic activity. Investment risk is related to the probability of losses in ROI (Return on Investment). 1. Interest Rate Risk – Whenever an investor invests in a bonds or mutual funds offering fixed rate of return, there’s always a possibility that interest rate might rise, and when this happens the value of that bond will decrease. 2. Business Risk – It is also known as unsystematic risk. Usually this risk is related with personal securities. For instance issuer of a bond, stock or any other short term asset might run out of cash and declare himself bankrupt. 3. Credit Risk – This risk refers to the situation where a particular bond issuer is unable to make expected principal payments, interest rate payments, or both. 4. Taxability Risk – Municipal bond offerings are prone to a certain type of risk. A security issued with the status of ‘tax-exempted’ might lose its status before it expires. As a result the investor will get lesser returns in comparison what he or she planned owing to low interest rate of municipal bonds. Every economic activity is prone to one or other risks, the basic concept of financial risk. For example credit risk, market risk, Foreign exchange risk, Shape risk, Volatility risk, Sector risk, Liquidity risk, Inflation risk and many more. The major area of risk in financial management are broadly categories into three types. These risks are often interdependent on each other which makes the company more vulnerable. For instance, exchange rates and interest rates are strongly linked to each other. The co-dependency of these risks should be taken under account while structuring the framework of Investment and Financial Risk Management. Financial risk management aims to protect the firm from these risks by using several financial instruments. It can be quantitative and qualitative both. Investment and Financial Risk Management subject involves managing the relationship between internal aspects of financial institutions and the external factors that influences the investment. Also, it deals in modern financial markets. Investment and Financial Risk Management proffers foundational understanding about underpin modern investment and risk management techniques. A firm needs to understand the intensity and types of potential risks it is prone to. Finance managers are supposed to thoroughly analyze the situation and they’ve to choose the most apt approach or process or method to check that financial risk. 1. Regression Analysis – This approach is used to study the effect on one variable when the other one changes. Let’s say for instance what changes will cash inflow encounter when rate of interest increases or decreases. 2. Value at Risk (VaR) – Another popular approach in measuring and checking the financial risk is VaR analysis. VaR is measured with respect to the amount of potential loss, the probability of that amount of loss, and the time frame. For example, a financial firm is exposed to 5 per cent one month value at risk of INR 50,000. This implies that there is a 5 per cent chance that the firm has to bear a loss of INR 50,000 in any given month. Let’s understand this concept with another example. Suppose another firm owns an investment portfolio on which they determine the VaR to be INR 100,000, at a 50 per cent confidence level over a 40 day holding period. Now, if no investments are infused or sold over within 40 days then there is a 50 per cent chance that the firm might lose out INR 100,000. VaR is estimate of the possible maximum loss. Actual losses may be above or below the estimated value. 3. Security Analysis – Analysis of tradable financial instruments like debts (money borrowed from market), equities (owner’s fund), mixture of these two and warrants of company is known as security analysis. Sometimes futures contracts and tradable credit derivatives are also included. Security analysis is further sub-categorized into fundamental analysis, which works in accordance to different fundamental business factors such as financial statements, and technical analysis, which focuses upon price trends and momentum. What if the stock market crashed by 38 per cent? What if interest rates were to rise by 100 basis points? What if the exchange rate were to rise by 40 per cent? What if an important client were to leave the firm? Now, the results of these hypothetical scenario analyses are converted into a risk measure by assuming the risk exposure based on the calculations and maximum loss predicted is assumed to be the worst case scenario. In this financial risk management course, you have learned about various types of financial risk and analysis techniques for evaluating risk. 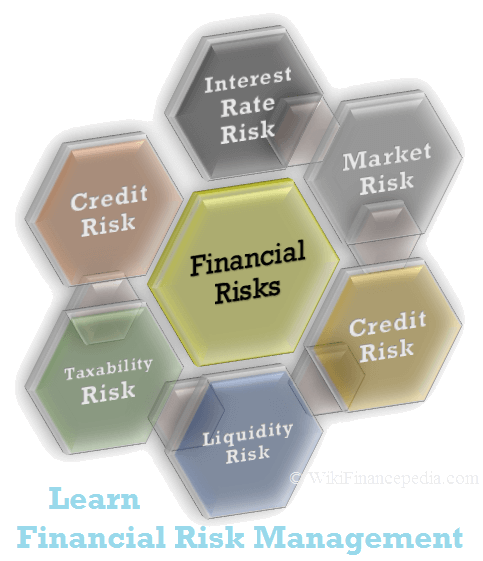 Highlighted are some of the important ways of financial risk analysis. Apart from this there are various financial risk management methods and techniques which can be used for analysis and evaluation.